I knew I was bringing this monstrosity. I had a 10th level kineticist who had been accumulating gold for several levels and had nothing to spend it on but more boring belts to bump up my stats. 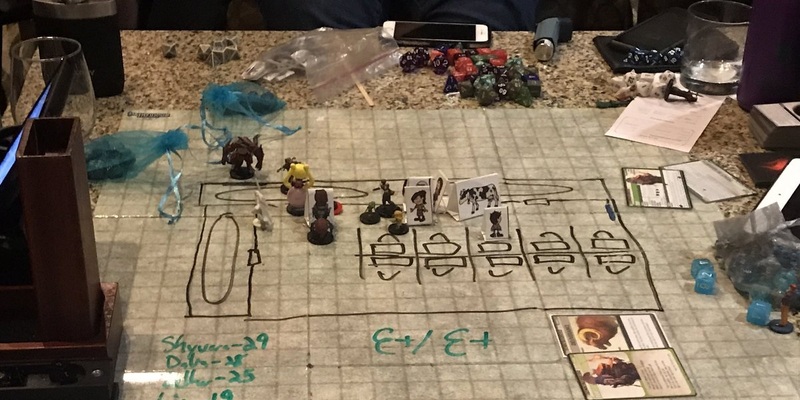 Armor wasn’t going to help much as I pretty much stay in the back, a weapon isn’t needed, and that 18,000 gp tiara that increases your damage by a whopping +1d6 just seemed… lack luster. So what do I do with all of this cash? Drop it on an airship. 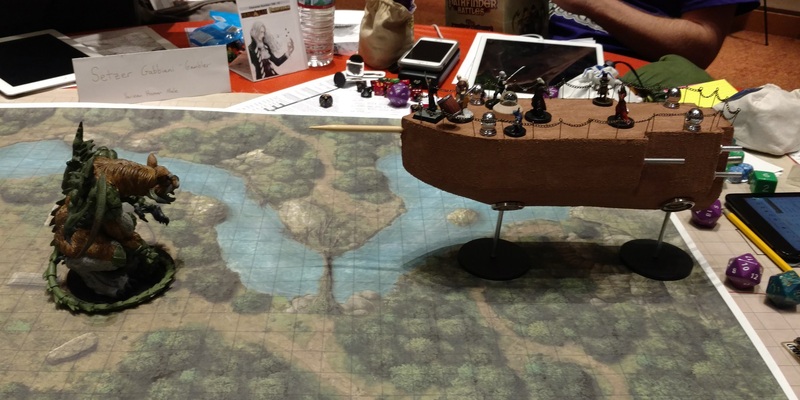 When you bring an airship to a game, it’s not enough to just say it exists and leave it at that. 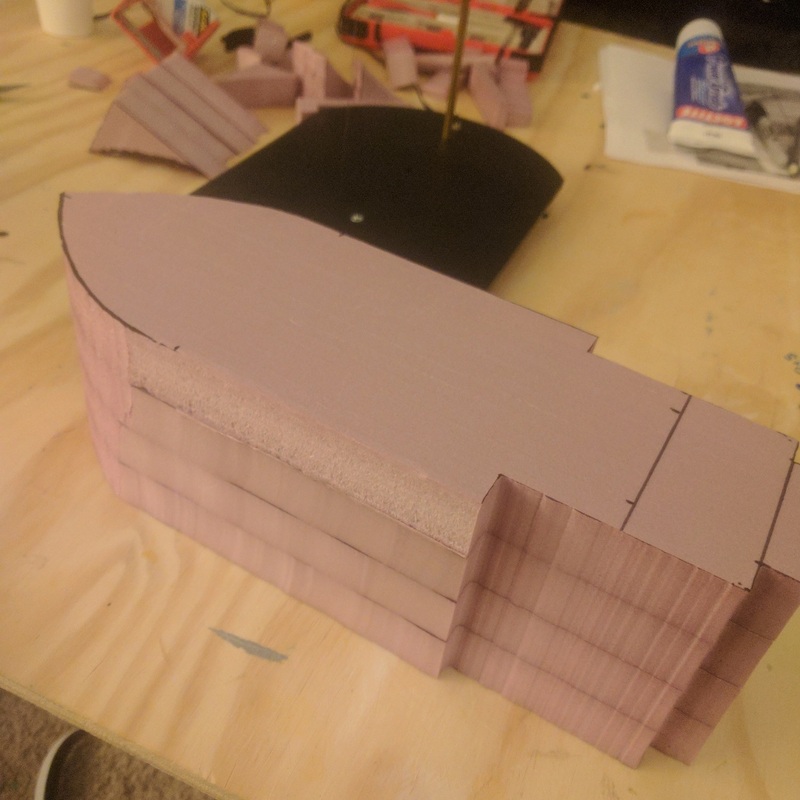 Even a nice printed and laminated 2D airship is nice… but not quite the big statement I wanted to make. So where do you go? 3D models. 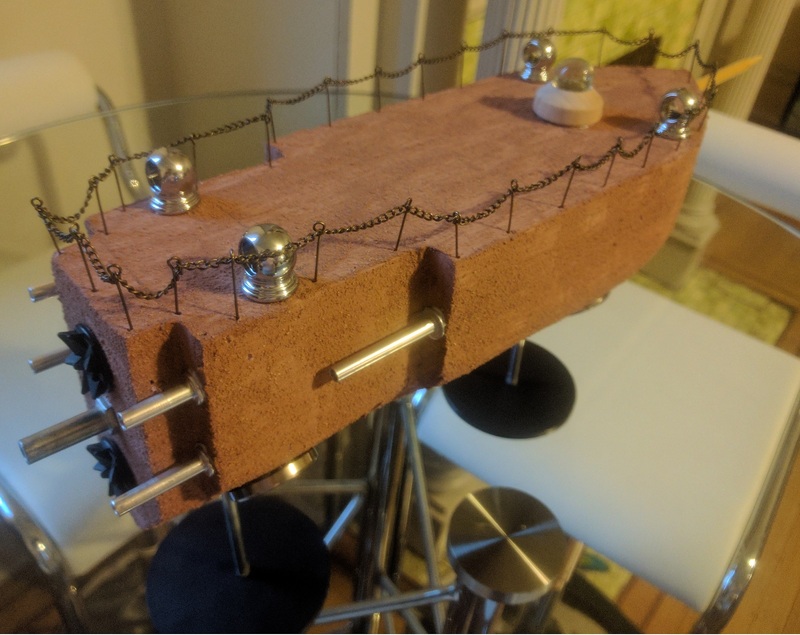 Using my foam cutting tools, I crafted the airship from several pieces of extruded polystyrene, slathered it in a mixture of foam coat and paint, added some chain rails with jewelry making tools, and stuck a big double base on the thing. I even kept it to the 20 ft. by 60 ft. size listed in it’s stat block, taking no chances that this thing wouldn’t be PFS legal. I packed it up for GenCon in a big cardboard box, held in place by some soft packing foam. Only a couple of local players knew about the airship, Quinn Shannon and Patrick Brennan. They made sure to have solutions for flying all worked out. I give a bit of a hint to the other players as well, “Have a way to fly.” I wouldn’t tell them why, just that it was important. But there was one hitch… I knew that there was a teleportation that happened as part of the scenario, having written the scenario myself. How was I going to get this colossal air vehicle through a teleportation spell? Quinn had an answer in his pirate barbarian named Captain Barbar Barbarbar and a fun new piece of loot. Perfect. 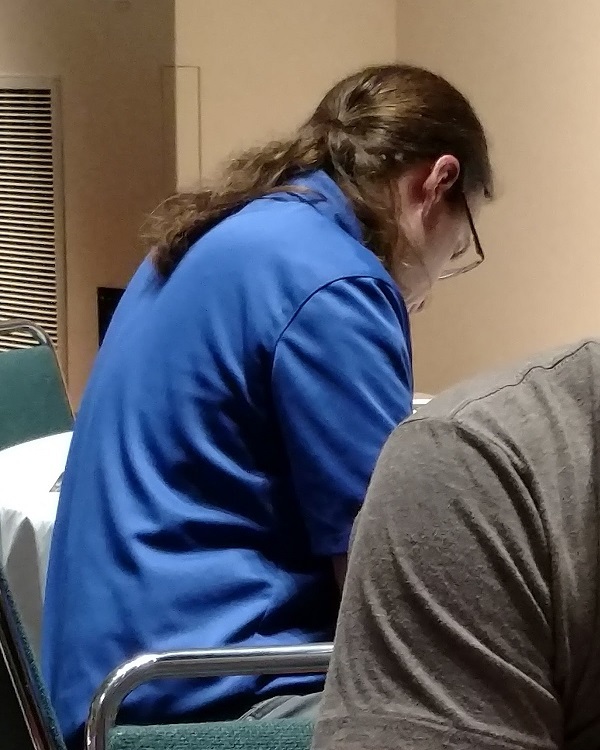 So there we were, GenCon 2017 at the big Interactive Special on Thursday night. The table: myself, Quinn, Patrick, Sam King, Lucas Servideo, and Seth Brummond. PFS author and friend Nathan King was the GM, and he had no clue what he had gotten himself into. “Oh, don’t worry about it,” I replied. I tell the table that I’ve got an airship that I’ve purchased for us to fly in. No tromping around in the dust for us. We get to soar over Belkzen in style. “But how can you afford an airship?” Nathan asks. 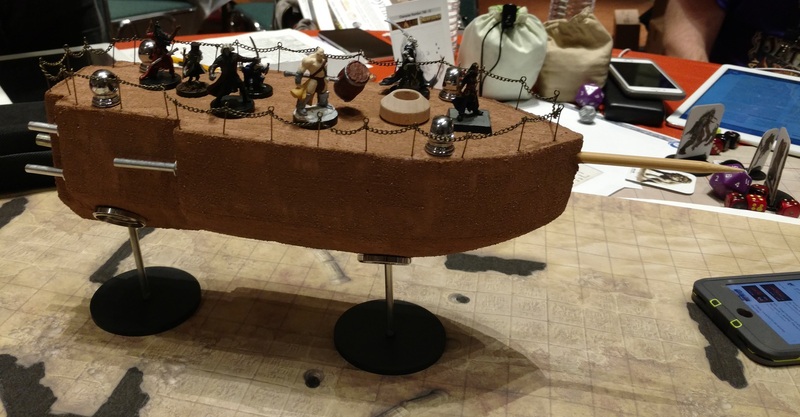 “Oh,” I reply, “I have better than that…” I go pull the airship model from the large box and set it on the table. Everyone continues to roar with laughter and now we’re getting people from nearby tables coming over to see what the disruption is. 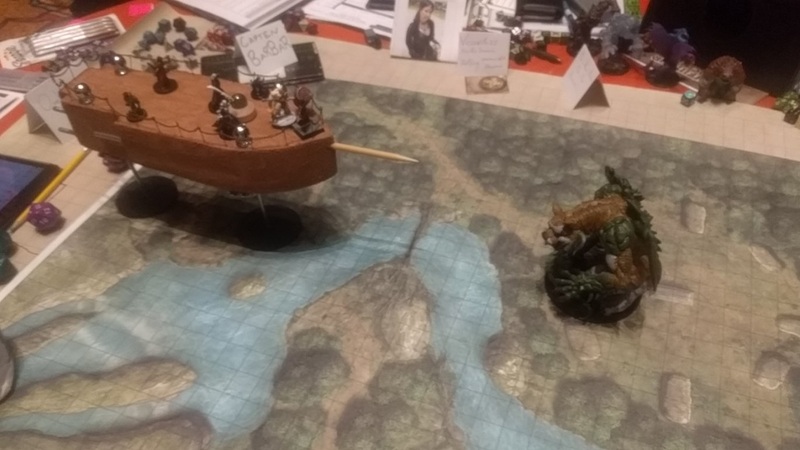 We have a fairly fair fight as the airship flies up the side of a mountain where there were giants raining boulders down on the caravan we’re supposed to be protecting. 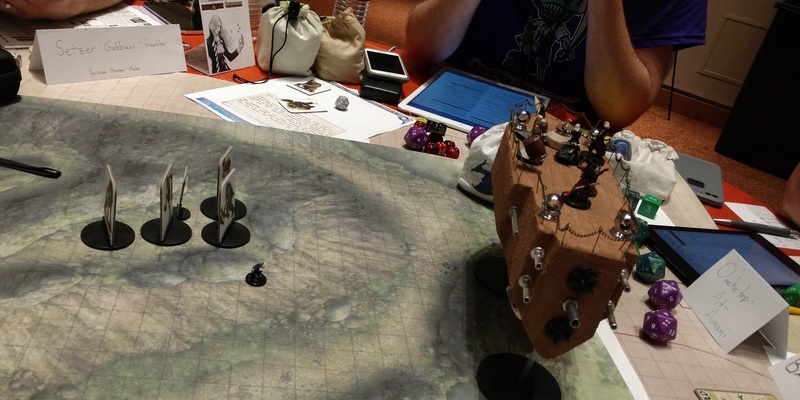 Instead of the climb up to them as we pelt them, we have a fun ranged attack battle where the giants toss boulders AT THE AIRSHIP! Barbar activates his winged boots and charges the giants. The eidolon is dimension doored into their midst and we wreck them. Fun had by all! He gives me a dubious look. “What? They’re only 50,000 gp,” I say with a clever grin. After a gulp and a bit of nervous laughter, I rejoin my table. Nathan has been pouring over the act 3 encounters during the entire break trying to find something to challenge us. He actually succeeds! 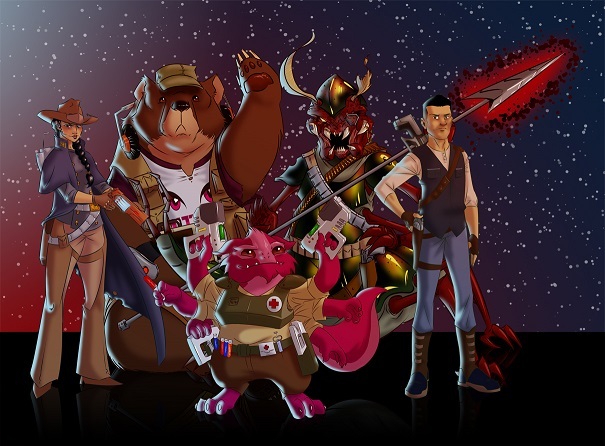 We fight a group of flying undead that manage to put some hurt on us before we vanquish them. 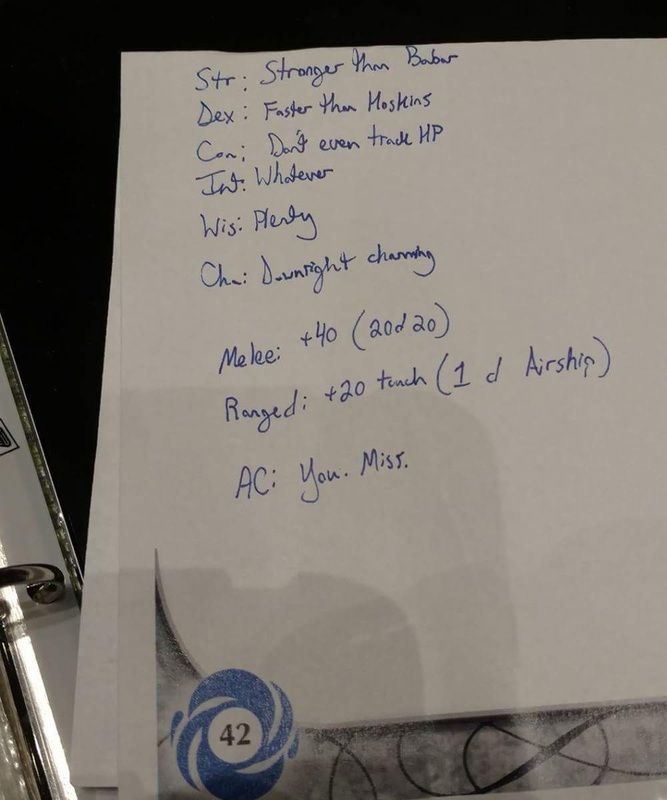 As we mop up another group of flying undead, John Compton comes back to the table with a sheet of paper. 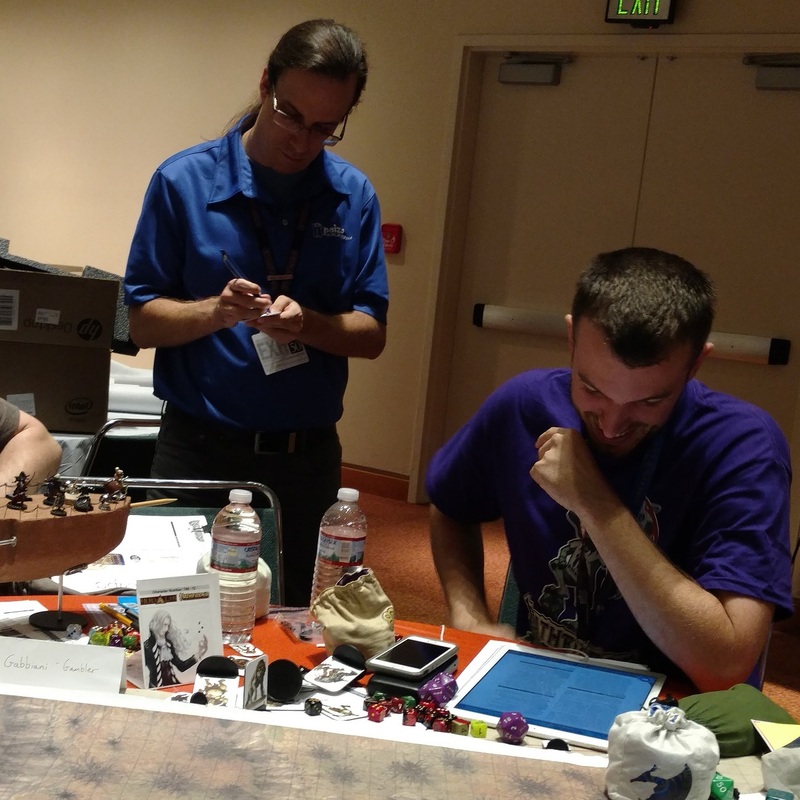 He hands it to Nathan as he takes him aside for a moment; the two of them speak in hushed tones we cannot hope to hear over the din of the gaming hall. After a moment, Nathan returns to the table, gleaming with confidence. He was smiling so broadly, you’d think he just won the lottery. It made the rest of us nervous. The final encounter is announced, we need to move on to the final area. We maneuver the airship into a wooded valley where a circle of standing stones sits by a rushing river. There’s a portal to the negative energy plane opened in the center of the stones and we need to find a way to close it. 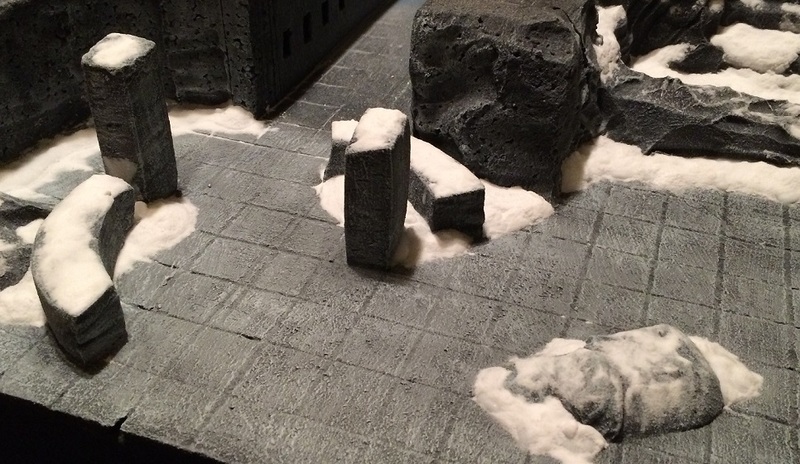 While we get the map ready and prepare ourselves, Nathan digs through a box of minis and pulls out a huge glabrezu mini and puts it on the board. “Roll for initiative.” My mind starts racing. That’s not my creature. This isn’t my encounter! COMPTON! None of us are quite sure what to expect… we tentatively fire attacks at it. Miss. Miss. Miss. Sam’s witch blasts it with a spell. No damage. Seth’s magus rolls to identify it: natural 20. Nathan tells us that it’s called “Compton’s Monster” and that it’s immune to all elemental attacks. That’s all we get. 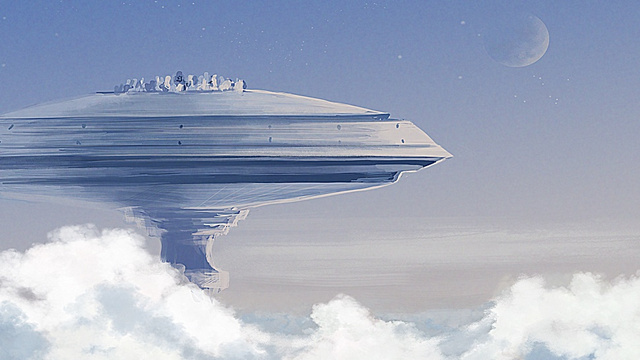 It greater teleports directly next to the airship, easily in striking distance of all of us. Nathan rolls the attack of opportunity, “Does a 56 hit?” Yes. Yes it does. He pulls out 5 20-sided dice and rolls them, and again, and again, and again. “238 damage. 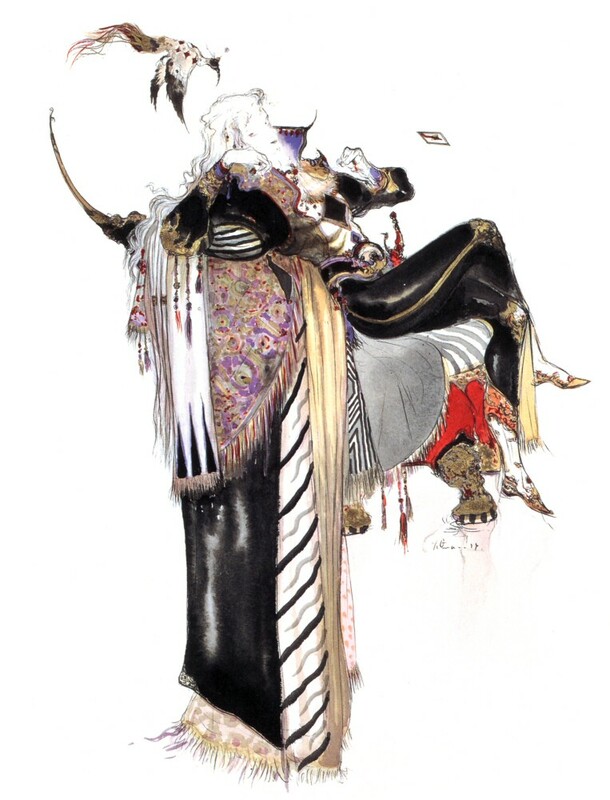 Is your eidolon dead?” Yes. Yes he is. Nathan rolls its save out in the open: natural 1. On my turn, I’m to frightened that it has Combat Reflexes and chose to go full defense and 5-foot-step away from it. The creature’s turn. 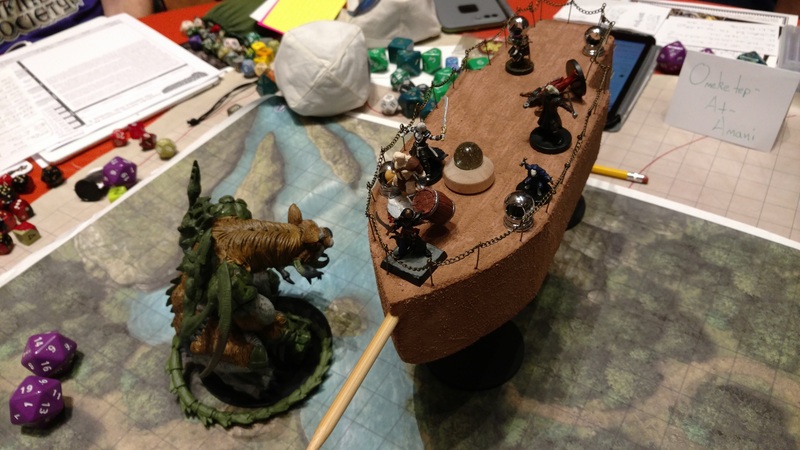 It picks up the airship… PICKS UP THE AIRSHIP! It then throws it INTO the portal to the negative energy plane, killing us all. John simply raised an eyebrow and walked away.